After a long illness Boyd W. Wilkes passed away on November 20 at his home, surrounded by family. He was born on May 30, 1928 in Freedom, Wyoming to William Edgar “Bill” Wilkes and Lillie Fluckiger. The family moved to Afton where Boyd attended school, graduating from Star Valley High School in 1946. They lived in several houses in Afton including the old Afton creamery, he had many great memories living in the creamery; they finally settled in their home on Adams Street and Third Avenue. Upon graduation Boyd enlisted in the US Navy and was stationed in San Diego, California for basic training, then Pearl Harbor Hawaii and later San Francisco. Some of his duty was served in Post-war Japan. He enjoyed serving in the Navy but was eager to return to Star Valley his home in the mountains and returned after being discharged. He attended Utah State University for a short time before living the remainder of his life in Star Valley. Boyd met the love of his life, Martha Ione Robinson and after a brief courtship were married on January 20th, 1949 in Idaho Falls, Idaho. To this union four sons were born Alvin Boyd, Gregg, Bart and Kip. Boyd and Ione lived their entire lives in Star Valley building their final home at their small ranch on the banks of Crow Creek west of Afton. They owned several different properties over their lives including small ranches in Freedom and the West Hills west of Afton; each was greatly improved from their ownership. Boyd worked many different jobs while growing up, in his youth he worked on the Fink Ranch on the Bedford Bench and obtained the nick name of “Fink” as he was affectionately known to his friends and family, also worked for Willard Nield on his farm and in his grocery store. He worked as the bookkeeper along with being a mechanic for his father-in-law Alvin Robinson at Robinson Motors in Afton and later would work for the US Department of Agriculture. He traveled the state of Wyoming and was assigned to Casper for the last 13 years of his work. He did not want to move his family to Casper because they loved Star Valley and did not want to disrupt their schooling so he traveled to Casper and back to Afton nearly every weekend for those 13 years. He retired from this position and took up his hobby of raising sheep, hunting, fishing, running trap lines and spending time with family and especially grand kids. He received several awards from his trapping from the Hudson Bay Company because of the quality and condition of his furs, he was truly in his element when he was out in the hills. He was a member of the Afton Volunteer Fire Department and served as Fire Chief during his involvement with the department. 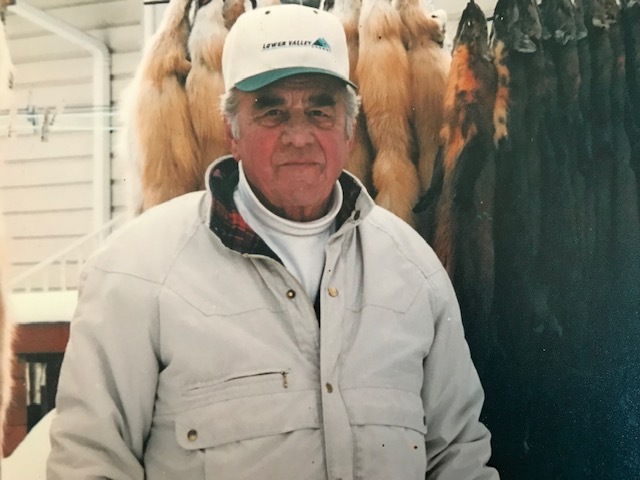 He was an avid outdoors man and loved to hunt, fish and trap. He instilled a love of the outdoors pursuits in his boys. He was never happier than when he was in the mountains or on a stream and spending time with his family. Boyd was preceded in death by his parents, a sister Helen Johnson, his wife, Ione after over sixty years of marriage, and his oldest son Alvin Boyd. Surviving are his daughter-in-law Karen Wilkes and sons Gregg (Kathie), Bart (D’Ann) and Kip (Misty) along with his siblings Nord (Joy) Wilkes, Carol Gardner, Myrna (Lynn) Brown and Jeanie Wilkes. He has sixteen grandchildren, twenty-nine great grandchildren and one great, great granddaughter. He will be greatly missed and fondly remembered by all who knew him. At his request no services will be held with the exception of a graveside prayer, cremation has taken place and ashes will be placed near his dear wife and son in the Afton Cemetery.